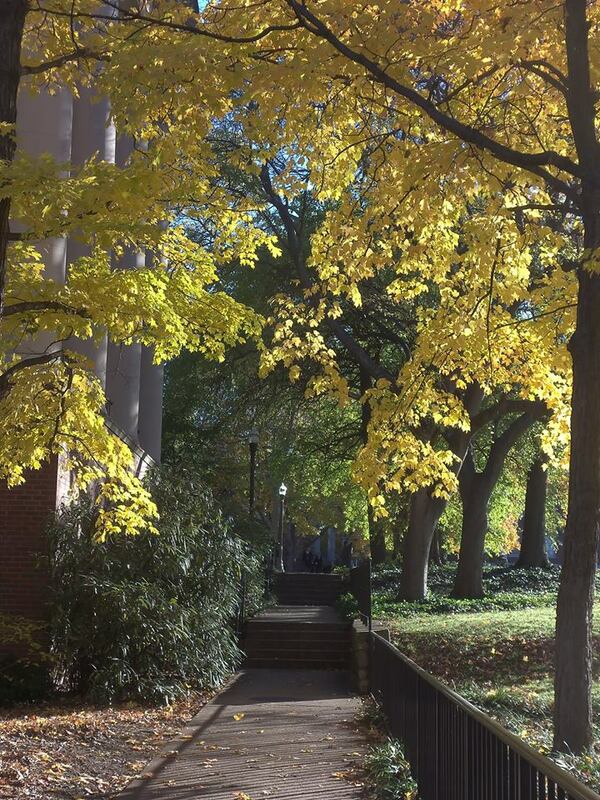 Fall at Vanderbilt University – nothing to do with my post but so lovely I wanted to share it. It’s a week later and I am relieved to have the letter and its accompanying attachments on their way to DSHS – all thanks to Dave Gagley. It will be interesting to see if there is an answer and if so, what it will be. Fortunately they will be sending it to Dave, not me. Now I am possibly making it out to be worse than it is, I don’t like messing with government in any form. I feel I have taken off my training wheels for the radio show, I am feeling more confident being on air, the times when I am suddenly at a loss for words are fewer and I am able to recover. I am still working on my archives, the downloads don’t quite fit the mb quota of my site. Definitely need to work out how to put it on iTunes as a podcast. I am also working on guests, some people are a bit shy about being on the air, even if it is on the phone. But I am not pushing because that doesn’t help make people comfortable. I am beginning to think my fatigue has loosened up a bit – I sleep all night, have naps in the afternoon and still have trouble getting up in the morning. I planned to do several things this week, instead I was dragging and had naps. Wednesday afternoon I went to the eye doctor for a check up – I’m doing well and there is only a slight change, I don’t need to buy new glasses. However, when we came home, I was in bed like a shot because I was beat. I also just saw snowflakes instead of lights and things were a bit blurry, seemed the smart thing to do since I couldn’t do anything else. Friday was a really good day. I was able to do things all day and didn’t feel the need for a nap. I can’t say the same for Saturday, I work with each day as it comes. I will say I am impatient to have energy again, it feels so long ago the last time I felt energetic. It’s so much easier to do things with energy. I am noticing I tend to say “I’m tired” – doesn’t help the attitude, my goal is to be aware of what I say about it and make sure it is positive. It’s a thought, and a thought can be changed. We have been having rain again, I really noticed it on Thursday. My legs and hips were stiff and sore, I knew something was going on, but not sure what. We had a lot of clear, cold and sunny days, we are back to the 40’s and 50’s with rain. Typical Seattle fall weather. I will take this rather than deal with snow, ice or any other cold stuff. I remember a woman I worked with at Boeing who was from Buffalo. she said when it snowed hard, her Mom would let her young sister outside because she couldn’t find her in the piles of snow. I’ve seen pictures of this last snowfall there – a lot of people have prepared for it and are concerned about the snow on the roof. When it starts raining, that snow will be even heavier. We had a snowstorm here with quite a few inches, then it rained and roofs caved in. They were showing on Lake Union the roofs of the boat houses collapsing from the weight. This coming week is a medical one, Monday afternoon is the dentist – talking to him about being on the show as well as my teeth. Tuesday is my rheumatologist and then my infusion. It will be my last visit to her, she is retiring at the end of the year (she is younger than I am). I will miss her, I’ve been going to her since I moved here 12 years ago. For their long time patients, they called each of us to let us know this was happening. also, there are 4 other rheumatologists now, so they looked to see which doctor would fit the patient. I will see Dr. Shasteen in January, I haven’t met her before but a friend had her as a doctor and really liked her. Nothing stays the same, certainly I haven’t stayed the same. I think I also see my primary care doctor as well. Have to check the calendar. Eddie is taking Thursday off – we have reservations at Il Fornaio for Thanksgiving dinner at 3:30. We haven’t done this before, so I’m looking forward to it – we enjoy their food and the people. For years Eddie would get a turkey as a work bonus and there we would be, a big turkey and the 2 of us. Some years we invited people over, or we were invited and we provided the turkey. I think last year we found a ball of turkey at Whole Foods, just dark and white meat and not too big for two. It worked out quite well. We have also taken care of Christmas shopping for my sisters plus our niece and her family in Toronto. We had everything sent so we don’t have to carry it on the plane. Let’s hope there isn’t an ice storm this year – it was really something last year.